You may have noticed that I disappeared for the past few months. I’ve been learning a new way of being, and incorporating the lessons into all areas of my life has been a practice. The idea behind this new way of living, is to simply let the day move me. In the past, I’ve spent a lot of time harnessing my own energy to create outcomes in my life. I’m currently learning to work with the universe and the energy that flows through us all, in order to let myself and my work be more of a universal expression than something created internally. Will power is a mighty force….however, it’s like a birthday candle in the wind when compared to the energy and power living within the universe, God, or Spirit (whatever you want to call it). Often times, we make decisions and move through life in reaction to all the events and people we interact with on a daily basis. We’re motivated by safety, competition, and fear. Though these feelings and reactions certainly have a place in our lives, after living by and through them for the past decade (oh my goodness!! ), I’ve decided that I no longer want to live my life based in fear. Fear based decisions simply lead to more fear. 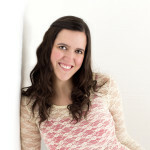 I choose to live my life based in love and to move through my days in that fashion. The universe is made of pure love, abundance, and joy. It seems to me, that we need only put our faith in that fact, and then choose to live through those channels and some spectacular things happen in life. Have you noticed how GREEN the grass has been looking lately? Right here….right in front of me (not over there…) this grass looks lusciously cared for and green. The past few weeks, I’ve noticed a universal nudge toward my creativity and the gifts I’m blessed to share here with you. So I’m back following that energy, and I hope it will bring some beautiful, pure, and universal expressions to life here on my blog once again. I suspect that letting the need for financial support, the competitive ambitions, and all the other fear based motivations go might help open up some space for something truly made of love here. I hope you agree. Have you ever tried a different way of being? Have you made more decisions based in love than in fear? How did these changes show up in your life? 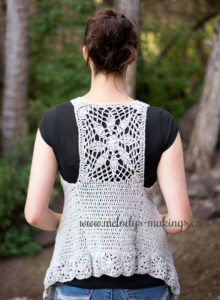 Today, enjoy my free crochet vest pattern – Sun Struck. This stunning vest features a gorgeous lacy block element on the back, and smaller lace blocks along the bottom. It’s a gorgeous pattern for welcoming back the loving sunshine of spring. Recommended yarn is a DK (3) weight yarn OR whatever size you’re able to achieve gauge with. I suggest using a natural fiber good for the warmer weather months like linen or cotton. 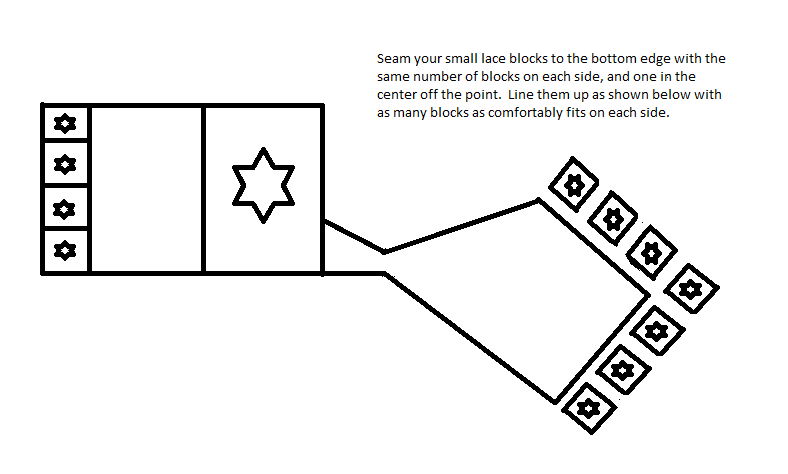 This will also help with blocking at the end of the project. Your project should measure 3” (7.5cm) x 3” (7.5cm) at this point. Your project should measure 6.5” (16.5cm) x 6.5” (16.5cm) at this point. Slip stitch into each of the next 3 sts (which should bring you to the corner stitch). We’ll now be working in rows. Turn work. Repeat Row 2 until your project measures 7” (17.75cm) in length from the upper edge of square. Do not turn work on last repeat. Fasten off. Seam 2 of the small lace blocks together and then seam that piece to the bottom edge you just completed. Block as desired. 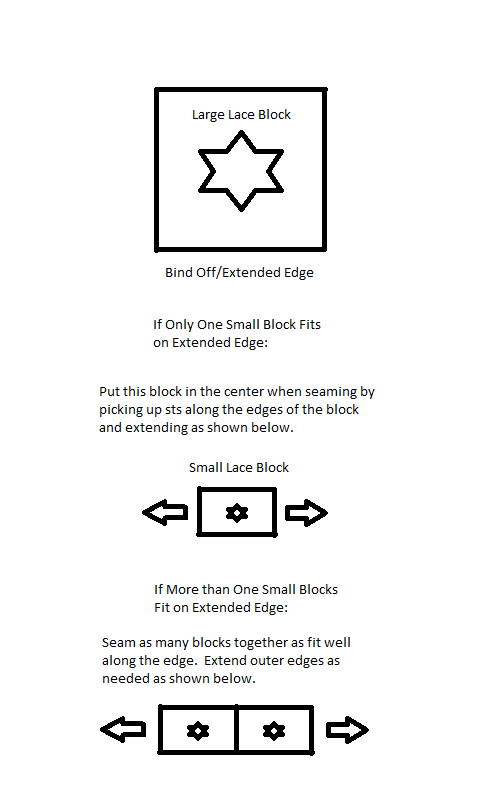 Return to the upper edge of the Large Lace Block piece you just created (upper edge is the opposite side of the edge you just extended). Attach a new strand of Color 2 yarn to the top right corner stitch with the right side of the project facing you. Repeat Row 6 until you’ve increased to 51 total sts. Do not turn work on last repeat. Fasten off. Seam 2 of the small lace blocks together. Seam 3 of the small lace blocks together. Seam these two pieces to the bottom edge you just created with the smaller, 2 block piece on the side closest to the back panel and the longer, 3 block piece on the side closest to the front opening. Return to the upper edge of the Large Lace Block piece you previously created (upper edge is the opposite side of the edge you just extended). Count 6 sts in from the top left corner stitch. Attach a new strand of Color 2 yarn to the stitch you just counted to with the right side of the project facing you. Seam 2 of the small lace blocks together. Seam 3 of the small lace blocks together. Seam these two pieces to the bottom edge you just created with the smaller, 2 block piece on the side closest to the back panel and the longer, 3 block piece on the side closest to the front opening. Block as desired. Lining up the front and back Small Lace Blocks, seam the back panel to the front sides of vest. Leave desired space for arm hole. I chose to leave 8” (20.25cm) open for the arm hole on my sample. Add a SC border around all outside edges of the project. Fasten off. Secure and weave in all ends. Your project should measure 7.5” (19cm) x 7.5” (19cm) at this point. Slip stitch into each of the next 4 sts (which should bring you to the corner stitch). Repeat Row 2 until your project measures 8” (20.25cm) in length from the upper edge of square. Do not turn work on last repeat. Fasten off. Seam 2 of the small lace blocks together, adding some SC sts in between the two blocks to make this piece the same width as the piece you just completed, and then seam that piece to the bottom edge you just completed. Block as desired. Repeat Row 6 until you’ve increased to 55 total sts. Do not turn work on last repeat. Fasten off. Your project should measure 8” (20.25cm) x 8” (20.25cm) at this point. Slip stitch into each of the next 6 sts (which should bring you to the corner stitch). Repeat Row 2 until your project measures 9” (22.75cm) in length from the upper edge of square. Do not turn work on last repeat. Fasten off. Seam 3 of the small lace blocks together, and then seam that piece to the bottom edge you just completed. Block as desired. Repeat Row 7 until you’ve increased to 65 total sts. Do not turn work on last repeat. Fasten off. Seam 2 of the small lace blocks together, adding in some additional SC in between the two blocks to make it long enough to match one side of the front portion you just created. 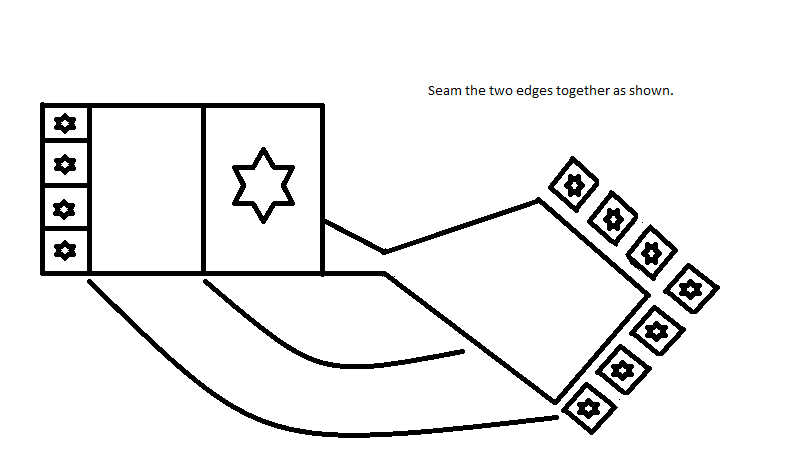 Seam 3 of the small lace blocks together, doing the same thing between them. Seam these two pieces to the bottom edge you just created with the smaller, 2 block piece on the side closest to the back panel and the longer, 3 block piece on the side closest to the front opening. Return to the upper edge of the Large Lace Block piece you previously created (upper edge is the opposite side of the edge you just extended). Count 7 sts in from the top left corner stitch. Attach a new strand of Color 2 yarn to the stitch you just counted to with the right side of the project facing you. Lining up the front and back Small Lace Blocks, seam the back panel to the front sides of vest. Leave desired space for arm hole. I chose to leave 9” (22.75cm) open for the arm hole on my sample. Your project should measure 9” (22.75cm) x 9” (22.75cm) at this point. Slip stitch into each of the next 8 sts (which should bring you to the corner stitch). Repeat Row 2 until your project measures 10” (25.5cm) in length from the upper edge of square. Do not turn work on last repeat. Fasten off. Repeat Row 6 until you’ve increased to 67 total sts. Do not turn work on last repeat. Fasten off. Your project should measure 9.25” (23.5cm) x 9.25” (23.5cm) at this point. Slip stitch into each of the next 5 sts (which should bring you to the corner stitch). Repeat Row 2 until your project measures 15” (38cm) in length from the upper edge of square. Do not turn work on last repeat. Fasten off. Seam 3 of the small lace blocks together and then seam that piece to the bottom edge you just completed. Block as desired. Repeat Row 8 until you’ve increased to 91 total sts. Do not turn work on last repeat. Fasten off. Seam 4 of the small lace blocks together. Seam 5 of the small lace blocks together. Seam these two pieces to the bottom edge you just created with the smaller, 4 block piece on the side closest to the back panel and the longer, 5 block piece on the side closest to the front opening. Return to the upper edge of the Large Lace Block piece you previously created (upper edge is the opposite side of the edge you just extended). Count 10 sts in from the top left corner stitch. Attach a new strand of Color 2 yarn to the stitch you just counted to with the right side of the project facing you. Seam 4 of the small lace blocks together. Seam 5 of the small lace blocks together. Seam these two pieces to the bottom edge you just created with the smaller, 4 block piece on the side closest to the back panel and the longer, 5 block piece on the side closest to the front opening. Block as desired. Lining up the front and back Small Lace Blocks, seam the back panel to the front sides of vest. Leave desired space for arm hole. I chose to leave 11” (28cm) open for the arm hole on my sample. Repeat Row 2 until your project measures 16” (40.5cm) in length from the upper edge of square. Do not turn work on last repeat. Fasten off. Repeat Row 8 until you’ve increased to 95 total sts. Do not turn work on last repeat. Fasten off. Your project should measure 10.25” (26cm) x 10.25” (26cm) at this point. Slip stitch into each of the next 7 sts (which should bring you to the corner stitch). Repeat Row 2 until your project measures 17” (43.25cm) in length from the upper edge of square. Do not turn work on last repeat. Fasten off. Seam 3 of the small lace blocks together, adding a few additional SC rows between each block in order to make this piece the appropriate width, and then seam that piece to the bottom edge you just completed. Block as desired. Repeat Row 8 until you’ve increased to 111 total sts. Do not turn work on last repeat. Fasten off. Seam 5 of the small lace blocks together. Seam 6 of the small lace blocks together. Seam these two pieces to the bottom edge you just created with the smaller, 5 block piece on the side closest to the back panel and the longer, 6 block piece on the side closest to the front opening. Seam 5 of the small lace blocks together. Seam 6 of the small lace blocks together. Seam these two pieces to the bottom edge you just created with the smaller, 5 block piece on the side closest to the back panel and the longer, 6 block piece on the side closest to the front opening. Block as desired. Lining up the front and back Small Lace Blocks, seam the back panel to the front sides of vest. Leave desired space for arm hole. I chose to leave 12” (30.5cm) open for the arm hole on my sample. Repeat Row 2 until your project measures 18” (45.75cm) in length from the upper edge of square. Do not turn work on last repeat. Fasten off. Repeat Row 8 until you’ve increased to 115 total sts. Do not turn work on last repeat. Fasten off. Return to the upper edge of the Large Lace Block piece you previously created (upper edge is the opposite side of the edge you just extended). Count 12 sts in from the top left corner stitch. Attach a new strand of Color 2 yarn to the stitch you just counted to with the right side of the project facing you. Your project should measure 11.25” (28.5cm) x 11.25” (28.5cm) at this point. Slip stitch into each of the next 9 sts (which should bring you to the corner stitch). Repeat Row 2 until your project measures 19” (48.25cm) in length from the upper edge of square. Do not turn work on last repeat. Fasten off. Repeat Row 8 until you’ve increased to 125 total sts. Do not turn work on last repeat. Fasten off. Return to the upper edge of the Large Lace Block piece you previously created (upper edge is the opposite side of the edge you just extended). Count 16 sts in from the top left corner stitch. Attach a new strand of Color 2 yarn to the stitch you just counted to with the right side of the project facing you. Lining up the front and back Small Lace Blocks, seam the back panel to the front sides of vest. Leave desired space for arm hole. I chose to leave 13” (33cm) open for the arm hole on my sample. Repeat Row 2 until your project measures 20” (50.75cm) in length from the upper edge of square. Do not turn work on last repeat. Fasten off. Repeat Row 8 until you’ve increased to 131 total sts. Do not turn work on last repeat. Fasten off. ©MelodysMakings and may not be copied or reproduced in any way. You have permission to sell finished products made from this pattern, but please leave a link to my website, www.melodys-makings.com, in your product listing specifying that I am the designer of this pattern. Thank you for supporting me as a work at home mother! Love this! Your step son is lucky to have you in his life. Thanks for sharing!